After all, if you'd developed an iron-chromium redox flow battery by improving NASA's creaky and quaint 70's technology, you'd want to show it off too. He's fighting to become major player in the nascent, global storage industry, which is poised for explosive growth as countries and states like California soon overproduce energy from solar and wind. The crowd has come to see the flow batteries convert chemical energy into electricity by pumping two electrolytes from separate tanks through stacks of EnerVault's proprietary "Engineered Cascade" technology, which are arranged in stages optimized to the electrolytes' state of charge. This makes them more than 60 percent round-trip efficient. That's lower than lithium-ion batteries, which are above 80 percent. It's also less than two competitors developing aqueous-hybrid electrolyte storage, Eos and Aquion Energy, which claim about 80 percent efficiency, as they all fight for the energy storage market. 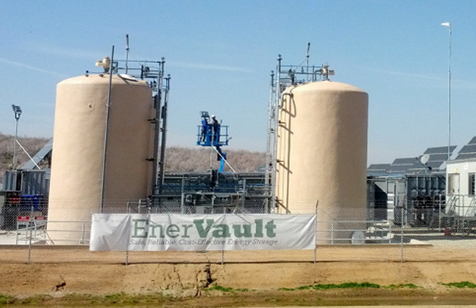 But Pape says EnerVault's market edge is cost and simplicity. Since the batteries pump electrolytes from one tank to another through the cell stack, the cost of energy goes down whenever you add more tanks of electrolyte. Although EnerVault has raised $30 million from companies like French oil major Total, Japanese giant Mitsui, and conglomerate 3M, that's lunch money for an aggressive grid battery startup. And this will get increasingly pricey. When [California Assembly Bill] 2514 hit, that was one of the most amazing inflection point days for employees and investors in a long time. Funded in part by over $4.7 million from the US Department of Energy and $476,000 from the California Energy Commission, the project is meant to prove the reliability of iron-chromium redox flow batteries for large, grid-scale storage. EnerVault has a lot on the line, because while there are 24.6 gigawatts of total storage projects in operation in the US, only 950 kilowatts come from flow batteries, and none from iron-chromium. Long-term reliability hampered by any failure is an infrastructure deal-breaker, and the system's electrolyte pumping systems could be an issue. Leading storage developer AES, calling itself technology agnostic, says it prefers "sealed batteries" like lithium-ion, skeptical of new battery companies that don't have a "track record," according to the Technology Review. EnerVault insists its electrolyte pumping system lasts "several thousand hours" and can be replaced quickly during a malfunction; the low chemical aggressiveness of iron chromium also improves the battery lifespan. But industry fears won't abate until the this project has been running long enough to test those assertions. Almond growers Steve Zeff and Kenfield Alldrin, the proud recipients of this huge battery, joined the sweating reporters and Federal and State officials as Pape spoke in front of four large electrolyte tanks. The two growers aren't strangers to solar energy. 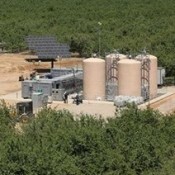 Most of their other orchards already have solar-powered irrigation systems, Alldrin explained. But before this battery was installed, any excess solar energy was sent straight to the grid before it was useless. Now it can be stored and used when needed. So with push of a ceremonial button, Pape 's 250 kW flow battery began to help the solar panels drive the orchard's irrigation pump. I don't have to have a factory. All I need to build is the cells and stack - there is no gigawatt factory required. I am going to be the big energy storage guy because the tanks come from a supplier, the pumps come from a supplier. Power conditioning and controls - all arrive at the job site with my cells and stacks, so I don't have to inventory. I have a very cash efficient business model, with 80% as pass-through. In the rapidly evolving storage race, technologies will continue to improve. Many battery companies will grow, and others will fail and disappear. With EnerVault's iron-chromium storage system, Joe Pape clearly expects to be a survivor. How long will it be before the winners and losers are obvious?